Every morning and evening I’m greeted by horses nickering. This twice-daily ritual at feeding time is a constant reminder that food is central to horses’ lives. Also central to the lives and well being of our horses is the role of a healthy, robust digestive tract. Biologists tell us that wild horses graze constantly, and they estimate that the nomadic horse spends at least 16 hours per day foraging on a variety of plant matter. Clearly, nature designed the horse to be in a constant cycle of food processing. By contrast, their domestic cousins, our horses, spend only about four hours daily munching hay and grain. The pressures of our modern schedules and contemporary horse keeping practices puts added stress on our horses’ natural process of digestion and food consumption, which can lead to many types of disharmony and disease. We can help our horses maintain optimum digestion and cope with the stresses of modern life. Through the use of Traditional Chinese Medicine’s many tools -- acupressure, acupuncture and herbal supplements. Since ancient times, Traditional Chinese Medicine (TCM) physicians have considered a strong digestive function to be the root of overall health and longevity. As a modern practitioner of Traditional Chinese Medicine, I like to think of horses as big digestive machines or “Qi“ factories. Qi: Qi in the TCM view is the material basis for all the normal physiological manifestations and life activities of the body. Qi drives the functions of the different tissues and organs. When qi is deficient, illness occurs; when it is absent, there is death. In the TCM view, there are five governing elements: earth, metal, water, wood and fire. 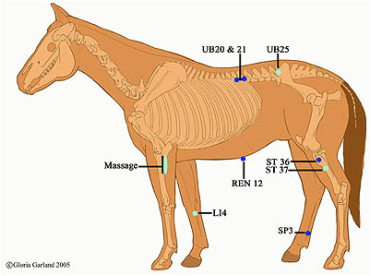 If we look at our horse through the TCM model, each organ system falls into one of five elemental classifications. For example, the respiratory system relates to metal; the circulatory system relates to fire; tendons, ligaments and hoofs relate to wood and kidney function relates to water.The digestive organs and their functions are classified as the earth element. The earth element, the stomach and digestion, is the source for all the qi of the body. Also referred to as “central qi,” it creates all the cells, tissues and all energetic and physiological functions of the body. A horse with a weak earth element can manifest in several ways: ulcers, poor physical development, chronic colic or diarrhea, declining condition in old age or poor muscle development, muscle tone or wasting. When the central qi is strong, the body functions more effectively on all levels, stress is better managed, illness and disease are better handled and recovery from injury is faster. The hay, grain, vitamins, supplements and water we provide are the raw materials for the central qi factory. They become transformed into the building blocks of the body. A strong digestive function can help our horses’ live longer, healthier lives. Shen qu (Massa Fermentata) This enzyme and vitamin B-rich herb enhances the digestion over all by facilitating the digestion of starches and carbohydrates found in high amounts in hay and grain rations. Mai ya (Fructus Hordei Germinatus) This herb protects the stomach and promotes the digestion of starches, especially wheat and rice based products. (caution - avoid use in large doses with lactating mares). Gu ya (Fructus Setariae Germinatus) Also digestive enzyme-rich, it is very good for horses prone to chronic, gas colic as well as for weak or older individuals. · Massage the outsides of the front legs – between knee and elbow to relieve abdominal pain. Traditional Chinese Medicine offers a wealth of treatment possibilities and wellness tools for the modern horse.